Coral Harbour is well known for its local carvers. Some of these artists are known worldwide. 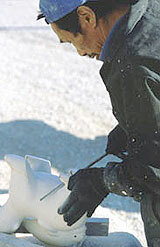 The carvers are often seen working on their soapstone in their back yards. Limestone is another popular stone which is carved because of its beautiful white color, great for Polar Bears.